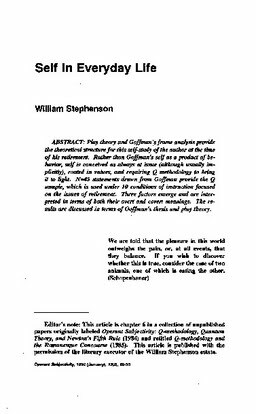 Play theory and Goffman's frame analysis provide the theoretical structure for this self-study of the author at the time of his retirement. Rather than Goffman's self as a product of behavior, self is conceived as always at issue (although usually implicitly), rooted in values, and requiring Q methodology to bring it to light. N=45 statements drawn from Goffman provide the Q sample, which is used under 10 conditions of instruction focused on the issue of retirement. Three factors emerged and were interpreted in terms of both their overt and covert meanings. The results are discussed in terms of Goffman's thesis and play theory.